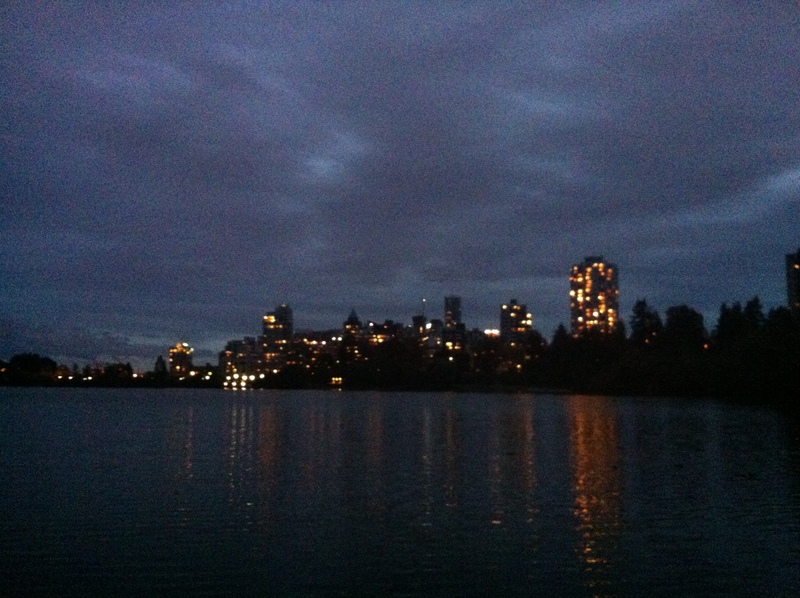 Nightscape: Vancouver from the edge of Stanley Park at dusk, looking southeast across Lost Lagoon. Photograph by Amanda Robinson, 20 October 2014. My experience as a tourist has often been about consuming the novel, quaint, or adventurous aspects of a place. As much as travel is about seeing and doing unfamiliar things, touring around unknown places can allow us to experience familiarity in paradoxical and sometimes unexpected ways. When the workshop, “Landscape, Nature, Memory: Tourism History in Canada,” began on 17 October 2014, Kevin James delivered his keynote speech by encouraging workshop attendees–and also students, faculty, and friends of the Simon Fraser Centre for Scottish Studies–to entertain the notion that leisured tourism in the modern era has often reified discursive notions of ‘us’ and ‘them’. His talk, and the workshop in general, re-inscribed a few things that I had previously considered about travel, leisured tourism, and local recreational pursuits, namely the tensions inherent to historical configurations of the tourist complex. Dr. James opened the workshop by expressing that a deeply ingrained sense of otherness came to inform popular, and perhaps infamous, depictions of highlander innkeepers and their lowlander charges in Victorian Scotland. Even in its infancy, this tourist model relied on the small inn or hotel as a contact point between different regionalisms in the United Kingdom, while also contributing to popular notions of how one might imagine, and corporeally engage with, the Scottish Highlands. His sources reveal the existence of a stark contrast between what tourists expected, and what they actually encountered while touring the countryside. Despite the unequal, and constantly shifting, power dynamic between tourists and locals, an increase in print media during this period–combined with rising literacy rates and the spread of travel literature–helped to create and sustain a ‘court of public opinion’, whereby larger cultural scripts correlated travel to the highlands with poor customer service and obstinate locals, who, in their exaggerated ‘backwardness’, symbolized everything that a lowlander perceived themselves not to be. James’s evocative research uses lively sources from popular culture to sketch a broad view of the attitudes of a transient group of tourists, who, although lacking in cohesion, were able to widely galvanize an informal and diffused protest against “inhospitable” conditions while on vacation in the north. Their collective grievances ultimately contributed to archetypal depiction(s) of greedy and grumpy highlander innkeepers. I was grateful for the practical research insights that this talk and other workshop dialogue yielded. I accumulated many fresh perspectives and methodological souvenirs during my stay at the scenic Granville Island Hotel, and came away with a more cohesive understanding of how tourism—now and in the past—works to (re)situate people, places, things, and ideas in a number of confounding ways. Despite the ruminating nature of this field, the presentations left me with a much clearer idea of what the contours of an edited volume on Canadian tourism history might look like, geographically and thematically. Perhaps most concretely, I left knowing that mobility–especially the dialectical nature of auto-tourism as both a historical and futuristic pursuit–structures the corporeal, symbolic, and economic manifestations of periphery and centre, which are at the heart of tourist impulses. Ultimately, the rhetoric of the foreign and the familiar factor into touristic relationships in a number of paradigmatic ways. In some respects, geographically peripheral landscapes offer a departure from the practicality of a tourist complex conceived of as a “last resort” for an economy on the edge, perhaps on the verge of collapse. More than once, workshop participants circled around the practicality and marketability of being on the edge; to viscerally feel (almost) lost in wilderness is intrinsically tethered to a desire to ‘get away from it all’–but perhaps not far enough to elicit the need to be rescued from the adventure. These exigencies run parallel to the other multiple, interlocking, and sometimes paradoxical characteristics of touristic economies: the practicality of servicing tourists; the drive for the almighty dollar; the commonplaceness of large infrastructure projects buttressed against the realities of touristic development; and the simple fact that pleasure tourism in the modern era has relied on an expectation of conspicuous consumption through the accumulation of things or experiences. In this regard, the workshop better grounded my perspectives on the manifestation of a capitalistic “if you build it they will come” discourse that has come to permeate the nature of touristic development. This suggested to me that ideas over what things have touristic value do not always translate into functional business models—an important ingredient in the concoction of popular tourist attractions historically. Similarly, even if a destination is popular initially, the tourist market changes and transforms. As we learned at the workshop, there are also times when it hasn’t deliver on all of its promises to locals, travellers, and investors. 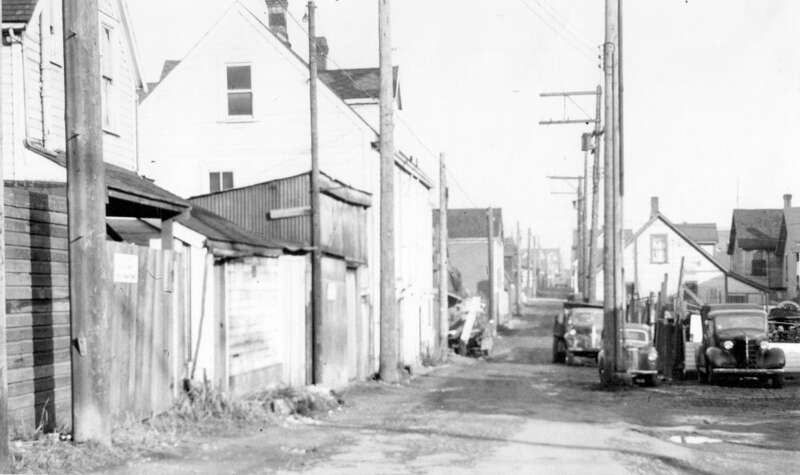 Streetscape: Hogan’s Alley in 1958, before “slum clearance” sought to displace members of this African Canadian community in place of the Georgia Viaduct. Photograph by A.L. Yates, City of Vancouver Archives , Bu P508.53, 1958. After the formal panel portions of the workshop wrapped up, we left our conference base on Granville Island and took an exciting water taxi ride through False Creek, landing at the “new” Olympic Village, where we met our tour guide, who escorted us on a winding, lively tour through Vancouver’s Downtown Eastside. We made stops in Hogan’s Alley, Chinatown , and Gastown –giving me the chance to pin a touristic geography to these places, which I had previously only conceived of tangentially. Our stops in Chinatown, Hogan’s Alley, and the Georgia Viaduct forced me to consider the urgency of centre and periphery, as I was reminded of the displacement of people and communities, either threatened or actualized. In the shadow of the industrial sublimity of the viaduct, the spirit of Hogan’s Alley–once home to a vibrant African Canadian community in the early and middle part of the twentieth century–lingers, reminding me that social inequality has long informed movement, travel, and the nature of the tourist market in disproportional, and sometimes tragic ways. Here, the analogy of periphery and centre are mirrored by the poverty, persecution, and social inequality that have come to permeate spatial relationships in Vancouver’s downtown, both historically and in the present. In this sense, being on the edge works to shape realties of human relationships on the ground, a dialectical process which is complex, nuanced, and inherently messy. As the workshop revealed, a number of factors come to bear on how touristic destinations have been imagined historically, and if they survived into the twenty-first century, and beyond. For me, all roads lead back to the nature of our consumer economy, and the multi-vocal ways in which tourism and human patterns of mobility are shaped by, and shape, the tourist market as an agent of capitalism. In this sense, I was also reminded of the degree to which the explosion and exploitation of mass media in the nineteenth and twentieth centuries worked alongside the growth of automobile transportation and other technological innovations, for example industrial infrastructure and photography, to modernize and guide the direction of respective tourist environments, the path that tourists took to the centre and the edge of Canada’s landscapes, and what happened to them when the got there. Amanda Robinson is a PhD Candidate at York University studying the shifting modes of transportation in modernizing Canada. Much of her work as a public historian is rooted in her ethnographic observations as a proud former auto and public transit worker in Oshawa, Ontario--also known as "Canada's Motor City" --where she was raised only few blocks from General Motors in the city's highly industrialized south end.